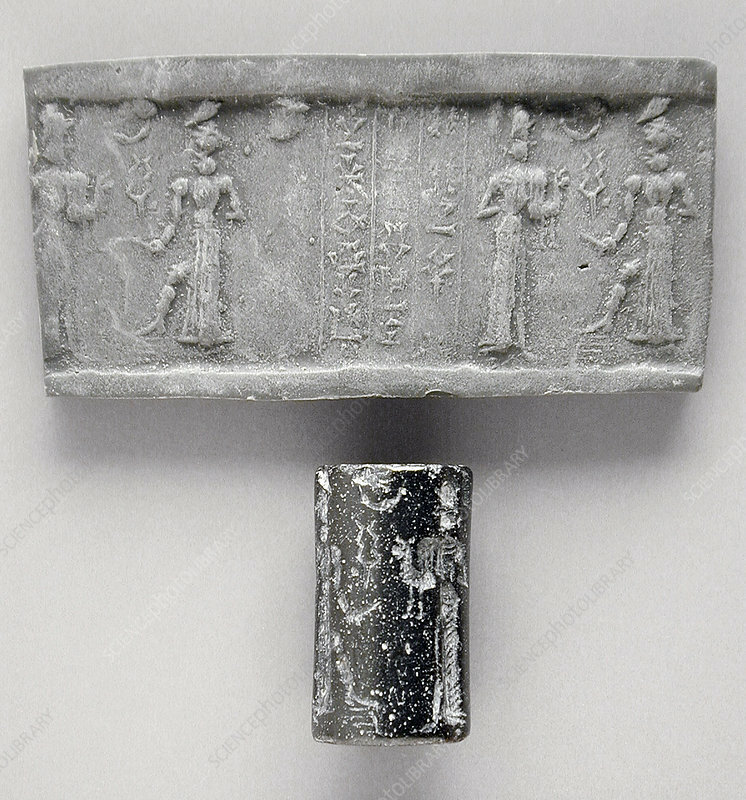 Babylonian Cylinder Seal, Mesopotamia, Old Babylonian period, circa 2000-1600 BC. Made from hematite. A cylinder seal is a small stone cylinder engraved in intaglio, an engraving or incised figure, depressed below the surface so that an impression from the design yields an image in relief when rolled on wet clay. It first appeared circa 3400-2900 BC and is considered to be one of the finest artistic achievements of Mesopotamia. They are linked to the invention of the latter cuneiform writing on clay cylinders. They were used as an administrative tool, a form of signature, as well as jewellery and as magical amulets. Later versions would employ notations with Mesopotamian hieroglyphs. Many varieties of material such as hematite, obsidian, steatite, amethyst, lapis lazuli and carnelian were used to make cylinder seals. The seals were adopted in Egypt and the Indus civilization.